Happy Birthday, Arachas ... err... I mean, Corintus! Ohhh... your Natalicio is on my favorite day... Día de los Muertos. will continue to experience Life anew. Thanks for all your great contributions to Death Squads! 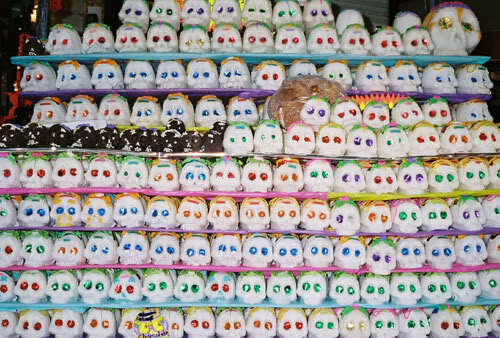 Now, go and enjoy your Sugar Skulls! HEY... don't over do it... you grow fat and lazy... and they will eventually KILL YOU! You share your B-Day with Dozer... what luck of mine have to deal with BOTH of you! I hope you enjoy a GREAT day. Thanks for sharing your experiences and life with all of us. CongratZ! Hope you had a good day! Sorry I missed your day...I hope it was a GREAT one. Still need to plan a proper party... but it WAS fun. Sorry I missed your B-Day... and Dozer's. I was away in training and just got home. I hope you enjoy a GREAT day. Thanks for sharing your experiences and life with all of us. Hehe, yeah, I seem to have thrown off some people with that name change. Excellent. You'll learn that's a thing for me: I enjoy changing usernames, avatars and stuff like that. frequently need a change of scenery. Even though I've been with the same girl for 8 years. I guess that's different! So anyhow: thanks guys! It was a great party, I got a ton off cool stuff: various expensive wines (oh yes), scotch (love it) and, to top it off: Battlestar Galactica the Boardgame! Which is seriously one of the most enjoyable boardgames I've ever played. Betrayal, backstabbing, politics... fun fun fun! Oh, and my sister got me Assassin's Creed: Revelations. NICE! I've definitely been spoiled by all these great people. Subject: Re: Happy Birthday, Arachas ... err... I mean, Corintus!